Greetings again from the darkness. 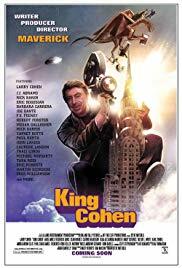 “That’s not the way it’s done.” Larry Cohen admits to having heard those words many times over the years, but in fact, it’s an accurate description of his 6 decade career as a Producer-Director-Writer. Filmmaker Steve Mitchell serves up a biopic and career retrospective of Mr. Cohen, and kicks it off with Cohen fan director JJ Abrams telling a story about the IT’S ALIVE prop baby and crossing paths with the man himself. Larry Cohen might be described as a schlock movie maker known only to those who are drawn to B-movie horror films. But that would be an injustice to the man who sold his first script at age 17, was the creative force behind numerous TV series, and has been a successful screenwriter for the films he directed, and many he didn’t. Walking us through a mostly chronological order of his life and career are Mr. Cohen himself, as well as numerous other industry folks … plus his current and ex-wife. Mr. Cohen relays a story about his grandfather’s wish to play the banjo, and how that story convinced young Larry that we was going to do what he wanted to do, and not be talked out of it. That turned into the mantra for his life and career. We learn that he was a talented and creative writer who only began making movies himself because he tired of other directors and producers messing up his work. Typically working with a very limited budget, Mr. Cohen mastered the art of guerilla filmmaking – “stealing scenes” when he had no authorization or permit to film. This includes a clip of Andy Kaufman joining an NYPD parade whilst dressed in full uniform. He also regularly filmed at his own house … a beautiful home originally built by William Randolph Hearst. Filmmaker Mitchell generates a treasure trove of inside stories from such recognizable figures as actor Yaphet Kotto, who explains how BONE and BLACK CAESAR started the Blaxploitation boom; legendary make-up and effects artist Rick Baker describing the IT’S ALIVE baby; actor Michael Moriarty speaks in reverent tones about his multiple collaborations with Cohen; Fred Williamson sparks a battle of egos in recollections of events; and Traci Lords, James Dixon, both of Cohen’s wives, Mick Garris, Eric Roberts, and Robert Forster all add their flavor to the lore of working with Larry Cohen. Directors Joe Dante and Martin Scorsese speak to his influence and how credible the work is viewed by other filmmakers. Even more fascinating stories are presented as Cohen talks about working with the great film composer Bernard Hermann, and then the shock of losing his friend to an unexpected early passing. The Betty Ford story is also quite funny in how it relates to Cohen getting THE SECRET FILES OF J EDGAR HOOVER filmed at Quantico and at Hoover’s home. There are also segments about Cohen’s work with two cinematic legends – Sam Fuller and Bette Davis. Not many can match this diverse list throughout their career, and Larry Cohen just seems to accept it as doing what needs to be done. He is described as “the master of the premise” as he has no shortage of fresh ideas, and his name would likely be more well-known were he more interested in self-promotion. Instead, he concentrated on projects that were entertaining and profitable, and importantly, filled with social commentary and humor. His process of writing scripts in long-hand or dictating into a handheld recorder contrasts with today’s technology, but it has not been detrimental to his daily writing. It’s hard to know if this film works better as a treat for fans of Cohen’s work or as an education for those unfamiliar. Mr. Cohen jokes that one film is not enough time to share all of his experiences. On second thought, he’s not joking. **Note: Larry Cohen’s younger sister was Ronni Chasen, the Hollywood publicist who was shot dead at a Beverly Hills traffic light in 2010. This entry was posted on Sunday, August 5th, 2018 at 10:27 am and is filed under Documentary. You can follow any responses to this entry through the RSS 2.0 feed. You can leave a response, or trackback from your own site.